Movies Anywhere seeks to solve the problem of fragmented movie libraries, a common ailment for movie lovers living in a digital world. Users often purchase films from multiple retailers, whether it be iTunes or Amazon, leaving those titles siloed in their respective repositories. For films from at least five Hollywood studios, however, that changes today. As part of a deal brokered by Disney, Movies Anywhere acts as a multi-platform content locker for movies from Disney, Sony Pictures Entertainment, Twentieth Century Fox Film, Universal Pictures and Warner Bros. Entertainment. Using the Movies Anywhere app or a corresponding website, customers who purchase movies or redeem digital downloads from participating online retailers Amazon Video, Google Play, iTunes and Vudu can view content on any of those same platforms or a standalone app. Users simply need to log in and connect their Movies Anywhere account with their digital retailer account. As for redemptions, the service incorporates support for digital copy codes that often come with Blu-ray and DVD discs. The system works much like Disney Movies Anywhere, a separate service for Disney properties, and supports library syncing, meaning customers can watch owned content on a wide variety of hardware including Apple devices like Apple TV, iPhone, iPad and iPod touch, Amazon Fire products, Android devices and Roku streamers. Additional hardware compatibility is in the works, as is integration with other retailers. "Movies Anywhere means that consumers never have to remember where they purchased a film or which device they can watch it on, because all of their eligible movies will be centralized within their Movies Anywhere library and available across platforms through the Movies Anywhere app and website and also available at their connected digital retailers," said Karin Gilford, general manager at Movies Anywhere. For now, the service boasts a library of more than 7,300 movies, as well as previews and extras. More content is expected for inclusion, as Disney and its partners are looking to bring other studios into the fold. To sweeten the pot for new users, Movies Anywhere is running a limited-time offer for five free movies. Users who activate and connect their account with Amazon Video, Google Play, iTunes or Vudu are eligible to receive digital redemption codes for "Ghostbusters" (2016) and "Ice Age." Linking that same account with a second participating online retailer nabs "Big Hero 6," "Jason Bourne" and "The LEGO Movie." 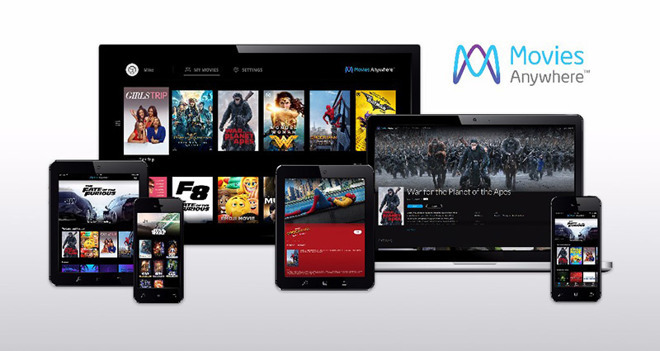 The Movies Anywhere app is not yet live in the App Store, but is expected to debut in soon as a free download. Users can activate a Movies Anywhere account through the service's dedicated website.